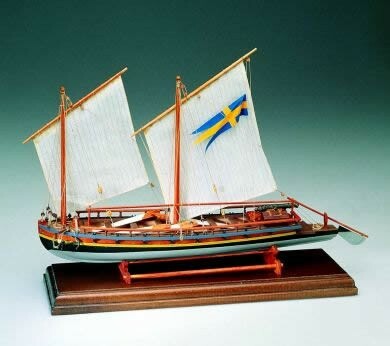 This superb model of a Swedish Gunboat was designed by the famous ship architect Frederick Henrik Chapman specifically for the fjord navigation. They were built to be very light and extremely easy to manoeuvre. This gunboat was armed with a medium calibre gun mounted near the stern on a sliding carriage. The kit features single plank-on-bulkhead construction, wood and metal fittings including cast metal oarlocks, anchors and cannon barrel, laser-cut wooden structural parts, dowels, pre-printed sails and flag, rigging line. Note that Instructions consist of a single sheet of plans with diagrams. Text labels in Italian.